* A Quinnipiac Poll released this morning has Thompson trailing Bloomberg 38 to 50 — 12 percentage points. Last week, Thompson was trailing by 18 percentage points. * The City Room has Thompson and Bloomberg gearing up for election day. The Daily News says they’re both pulling out all stops. * New York magazine, which thinks that Bloomberg’s third term is all-but-official, says that Bloomberg will have a hard time working with the UFT. * Michael Barbaro writes about the usual truth-stretching that seeps into campaign ads every election. * City Hall News reports that the Bloomberg campaign believes it has neutralized the Working Families Party as a factor in the mayor’s race. * The Daily News reports that there are still a significant amount of New Yorkers who don’t know who Bill Thompson is. 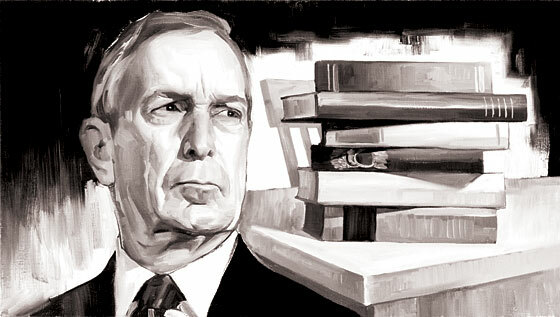 Reading List: The Marist Poll, Bloomberg – The Education Mayor? * A Marist Poll released today shows Bloomberg leading Thompson by 15 percentage points. An internal poll the Thompson campaign released last night showed Bloomberg leading by only 3 to 7 percentage points. * Meredith Kolodner reports that a study by the Dept. of Education shows charter schools performing worse than public schools, and is doing a poor job of reaching out to special-education children and English language learners. Mayor Bloomberg has called for the state to lift its cap of 200 charter schools. * Elizabeth Benjamin reports that SEIU 1199 is officially staying neutral in the mayor’s race, despite opposing Bloomberg’s term limits extension and voting in favor of giving Bill Thompson the WFP nod this summer. Another union staying neutral? The UFT — just when the teachers’ contract is set to end. This year, the powerful United Federation of Teachers skipped endorsing in the mayor’s race. But a small, dissident faction within the union has decided to break ranks, calling the UFT’s silence a sell-out. So who did the group of rabble-rousers lift up their voices for? Their advice? Vote for anyone on the ballot. Anyone not named Michael Bloomberg, that is. Claim: The Bloomberg campaign says, as school board president, Thompson presided over low performance and waste. Meanwhile under the mayor’s tenure, test scores are up, school violence is down and $350 million has been cut from bureaucracy and put in the classroom. FACTS: The mayor is definitely right about one thing: Test scores are climbing, according to the Department of Education, and fast. Between 2002 and 2009, the number of fourth grade students who met or exceeded state standards in math went from about 52 percent to 84.9 percent, according to statistics provided by the city’s education department. In 2002, less than 30 percent of eighth graders met state standards in reading. In 2009, 57 percent made the grade. Whether the rise is because of easier tests, the mayor’s changes to the school system or something else entirely remains unclear. The statistics also improved under Thompson’s tenure as president of the Board of Education — granted far more slowly. From 1999 to 2001, the years the city used the state exam while Thompson was president of the Board of Education, the percentage of fourth graders who met state math standards went from 49.6 to 51.8 percent. For reading, fourth graders who met state standards increased from 32.7 percent to 43.9 percent. According to the city’s Department of Education, the percentage of eighth graders who met reading standards dropped from 1999 to 2001 — from 35.2 percent to 33 percent. Keep in mind: Thompson did not control the schools as school board chief — he shared that with the mayor, the chancellor and the other board members — making it difficult to attribute student success or failure to his actions. From 1996 to 2001, the years Thompson was president, high school graduation rates went from 48 percent to 51 percent. During Bloomberg’s tenure, graduation rates have climbed from 51 percent to 66 percent, according to the Department of Education. Claim: Thompson says his record as president of the Board of Education led to mayoral control. FACTS: According to at least one colleague at the Board of Education under Thompson’s reign, his actions did help move the city’s school system toward mayoral control. “His efforts were precursors to mayoral control. He played a leading role in governance changes,” Sandra Lerner, a former board member from the Bronx, told Gotham Gazette earlier this year. While in the post, Thompson advocated for mandatory school uniforms and a chancellor’s district for low performing schools. He was thought of as a conciliator. At the same time, in 1996, just before he took over the board presidency, Thompson told the New York Times he opposed giving then Mayor Rudolph Giuliani control over the school system. He has since said he supports mayoral control. We just posted Leonie Haimson’s article about the double standard the Times uses to favor Bloomberg. And just a few weeks ago, we posted about the Times removing Bloomberg’s name from an article about Stuyvesant Town’s owners nearing default, which showed him responding to criticism. Now, Azi Paybarah reports the Times has demoted a headline praising Thompson’s experience as president of the City’s Board of Education — a headline that directly contradicts Bloomberg’s assertion that Thompson’s presidency was a failure — to a muter one. The New York Times went up today with a generally positive story about Bill Thompson’s time at the Board of Education, which ran under an unconditionally positive headline: “Leading Board of Education, Thompson Wielded Deft Hand Behind the Scenes.” It was an uniequivocal refutation of the Bloomberg campaign-generated narrative of Thompson as an ineffectual hack whose passivity made him responsible for the many failings of the public school system when he was on the board. Later, though, the headline was changed to the more muted “In School Post, Thompson Was a Conciliator.” Which is respectful enough, but very, very different from the first headline in transactional terms. Acting on a hunch, I asked a Bloomberg campaign spokesman if anyone from the campaign had contacted the paper to complain about the original headline. The spokesman said that no one had. * Bloomberg says if he is elected a third term, he’ll get rid of the Public Advocate, reports the Staten Island Advance. * The Downtown Express reports that Bloomberg thinks parents do not need a role in deciding issues like school crowding, school zoning or the planning of new school sites. * College kids are actually talking about the mayoral election, reports The Ticker.